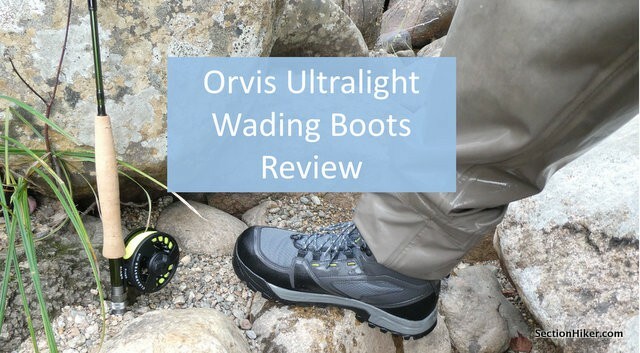 Orvis’ Ultralight Wading Boots are rubber-soled wading boots that I wear with stocking foot waders when I fly fish rivers with a rod and reel. On wider streams and rivers, a rod and reel, waders, and wading boots give you the extra mobility, reach, and precision to place a fly where trout are likely to be holding. I also fish with a Tenkara rod on small and medium-sized streams, but I can usually place my fly exactly where I want it from the stream bank without getting wet. As a hiker and fisherman, I get my kicks by hiking into streams and rivers that are off the beaten track. I like pouring over maps and identifying blue lines that look promising, then hiking into them and seeing what the fly fishing is like. I frequently backpack in, so keeping my gear as light weight as possible is a priority, especially if I have to bushwhack because there isn’t an established trail where I want to go. Waders and wading boots are an essential on wide rivers for better reach and mobility. Dead Diamond River, NH. The nice thing about the Orvis Ultralight Wading Boots is that they’re perfectly good for hiking moderate distances, even when I’m wearing a pair of waders with thick neoprene booties. They fit like hiking boots and don’t require any break-in time. They have foam footbeds which you can remove and replace with an insole like Superfeet if you need a higher arch, and they even have a gaiter hook at the base of the tongue if your waders have gravel guards. While they have Vibram soles and good traction on dry ground and rocks, you really do want to add cleats to them to penetrate the biofilm on moss-covered rocks, above and below the water’s surface. Even then, carrying a wading staff or an old trekking pole is a good idea to keep your balance when traversing rocky river bottoms. The Ultralights, conveniently, have pre-drilled cleat holes that make it easier to screw in cleats. I’ve been using the Orvis Posigrip Studs with the Ultralight Wading Boots and they work nicely on mossy and vegetation covered surfaces. You do need to be careful however when scrambling over exposed and dry rock, because the studs can unexpectedly slide off them. Think about it this way. When you put studs in your boots’ soles, you’re reducing the amount of contact you have with a rock surface to the tops of the studs’ heads. This makes it really easy to slip when you cross dry rock off-balance or with any momentum. It’s just something you need to be very conscious of if you clamber along rocky riverbanks. Orvis Ultralight Wading Shoes are sized like hiking boots making them easy to hike in and wear all day on the river. Size-wise, I wear a size 10.5 shoe and need a size 12 Ultralight Wading boot to fit the stocking feet of my waders. The funny thing is, these wading boots don’t feel like size 12 boots. They don’t alter my gait in any way and I can drive my car (even a manual) with them just fine, even with the cleats. But the proof of the pudding is that I can wear these Orvis Ultralight Wading Boots all day and still remain comfortable. You don’t feel like you’re wearing cement overshoes, which is a good thing when you’re fly fishing a river! Disclosure: Orvis provided the author with wading boots for this review. These are tempting. I haven’t yet felt the need to buy wading boots. I recently got a pair of packable waders (under 2 lbs) and I’m able to wear them with my existing trail runners. How do you fit the socks into your regular trail runners. Are they insulated? I don’t wear these boots all the time, but frequently enough. They really do keep my feet much warmer in cold water. The ones I have use a thin rubber bootie, not a neoprene sock. I wear a thin liner underneath and remove the footbed from my trail runners and it fits fine. I recently did a 4 day backpack/fishing trip (26 miles) in the Yellowstone NP and used these boots to backpack and wet wade in. They worked very well. I also tried on the Patagonia lightweight wading boots which were well constructed but were too wide in the arch and heel for my foot. My main concern was a good fit for backpacking and the Orvis boots were a much better fit for me. I wore wool socks to hike in and liner socks & neoprene socks to wet wade in. No need to carry additional footwear. The only minus is that the boots do not dry quickly after wading (especially since the temps dropped into the 30s overnight) so I alternated 2 pairs of wool socks. The first pair sucked the moisture out of the boots as I hiked some miles then at a rest break I’d change to dry socks & hang the damp ones to dry on my pack.